With it being the end of October, reality has set in that November is going to be here real soon. So, I started thinking about what units we will do in the 3 weeks we have school in November. Yes, I did say 3 weeks. We get the whole week of Thanksgiving off because we choose 3 nights in early October once a week to hold our fall conferences. It's tiring, but it is well worth it!! So, one of the things we do in November is talk about Veterans Day. We use a word list and word cards in our writing center along with our journal time. 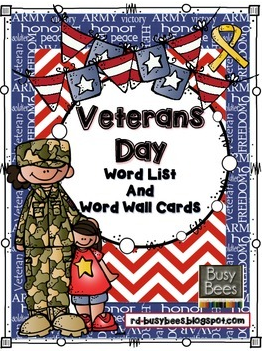 You can find this product in our TPT store by clicking on the following words: Veterans Day.